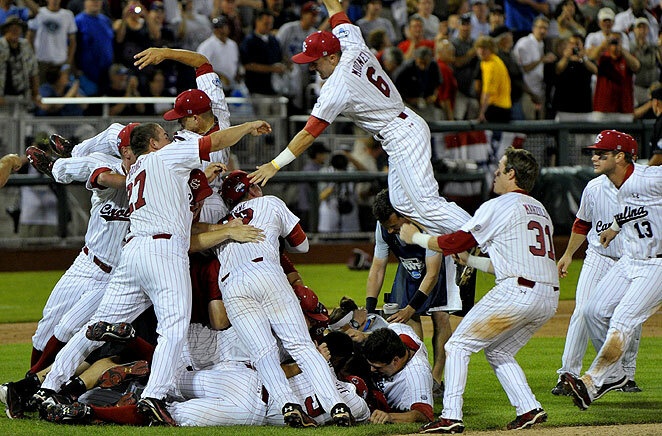 The Dogpile – A familiar sight the last three years. What really happened here? What did we witness? Well, Gamecock fans, I am here to tell you that we witnessed (and are witnessing) a dynasty unlike anything we have ever seen as a fan base. We are a program that has emerged from a decent history in baseball to become the unquestioned top program in the sport. I tried to come up with some comparisons of teams who became the best and were not a traditional powerhouse: We are the equivalent of LSU’s baseball program in the 90s (trust me, it’s harder now than it was then). We are the baseball equivalent of Miami football in the 80s (stay with me, I’m talking new dynasties-otherwise, we have nothing in common with them). We are the basketball equivalent of UConn basketball (both men and women, to a certain extent). Make no mistake, this is extremely rare air for us. Aside from a very brief period in the 70s when the basketball team challenged the big boys, we’ve never even approached this level of excellence at anything. Now, our baseball program is the simply the best in the country, and I challenge anyone to make a plausible argument otherwise (yes, Arizona, you won and deserved it, but we are talking about the overall program for a moment). Soak it up folks. This is what it feels like. We’ve always wondered what it would be like to be on top, to have everyone else aspiring to be like us. Sure, I know it’s baseball and not football (or even basketball). You know what I say to that? So what. Our fan base has long hungered for a big winner. Now we have one. And dag blastit, we deserve this. Coach Tanner and the players have been profusely thanked and honored and they too deserve all the praise they are getting. We at TRC join in. Our only regret is that we didn’t get to dogpile. I blame Aaron Fitt. A dynasty, yes, but we did not get to this point by beating up the opposition with overwhelming talent. Instead, the program became the best by being the best at the little things: pitching and defense. We also benefitted from being the underdog. I really think there’s something to the underdog thing. While I like Aaron Fitt and Baseball American a whole bunch, things were best for us when Aaron and his cohorts were picking us to lose to UCLA, to Florida, to UConn, and others. Over the past few years I can’t remember those guys ever picking us to win a big game. That changed when Fitt and John Manuel did their finals preview podcast last week. While Manual held true form and picked the more “talented” Arizona team, Fitt succumbed to the allure of the gritty Gamecocks and actually picked us to win. So, I blame Aaron Fitt for the loss. It’s clearly his fault for upsetting the underdog karma. The Shirt. 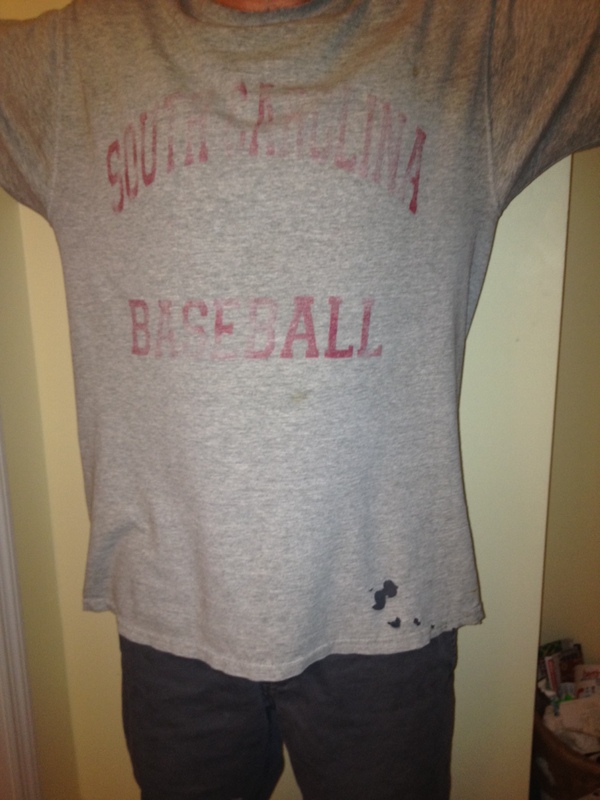 It didn’t always work, but it was uncanny how often my old South Carolina Baseball shirt has proven to make a difference. Purchased at the Regionals or Super Regionals in 2002 (I think Buck was with me, but I’m not entirely sure), The Shirt has seen better days. It’s faded and rotten around the collar. Worn as an undershirt during important games (both Alabama wins come to mind), The Shirt has consistently produced for the Gamecocks. At a football tailgate last year I had the luck of running into Coach Tanner. Less than fully sober and thinking that Ray surely wanted to hear about The Shirt and its vast powers, I proceeded to give him a viewing, holes and all. While I thought it was pretty cool, Ray told me not to wash it but sort of looked at me like I was crazy. This post season I left The Shirt off until needed. Put on right before the 5th inning against Florida, The Shirt produced 5 runs. Put on in the 7th inning against Arizona in the final game, The Shirt produced the tying run. Coupled with my ritual of watching TV when we hit and listening to the radio when we pitch and play defense (which worked like a champ the last two years), I thought The Shirt would get it done once again. Alas it wasn’t to be. While The Shirt is undoubtedly the most powerful good luck charm out there besides the Avatar Spirit Stick, we at TRC would like to know what other items or rituals are out there that seemingly cause the Gamecocks to win. How well do you see our Gamecocks being next season? We return some solid players but lose some valuable ones too especially Roth. Your thoughts? Thanks for your comment. We will have more on next season later, but know that we are very optimistic about a 4th consecutive trip to Omaha. Ray has it rolling.